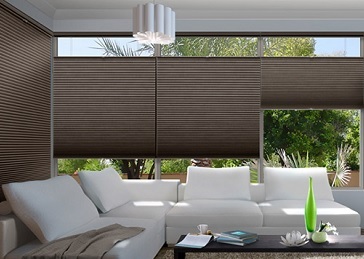 Honeycomb or Cellular Blinds are a stylish and contemporary window finish that also delivers a high level of energy efficiency, retaining your homes warmth in the winter and keeping out heat from the harsh summer sun. In addition to reducing heating and cooling needs, honeycomb blinds can provide extremely versatile levels of privacy and light control. Available in single and double cell, blockout and translucent options, Honeycomb blinds can also be raised from the bottom up as well as the top down (top down and bottom up configurations). This allows light into the room when the blind is lowered from the top while maintaining privacy by covering the power portion of the window.